When it comes to great places to eat in and around Deakin, Canberra’s foodies are likely to steer you towards Beess and Co in Yarralumla, 210 Degrees in Hughes or perhaps Double Shot at Deakin shops. And while each of these places is worth a visit, there’s one local and unpretentious café that is often overlooked: Café D’lish. Run by a husband and wife team, it’s located next door to the pharmacy at Deakin shops. All food is prepared fresh on site (I believe they even make their own bread), with a preference for local produce where possible. It’s been a few years since my last visit, but I remembered enjoying the food and coffee when I worked nearby. With a very empty fridge and no inclination to leave the office to brave the icy wind and cold for lunch, picking up a sandwich from Café D’lish on my way to work yesterday morning was the way to go. 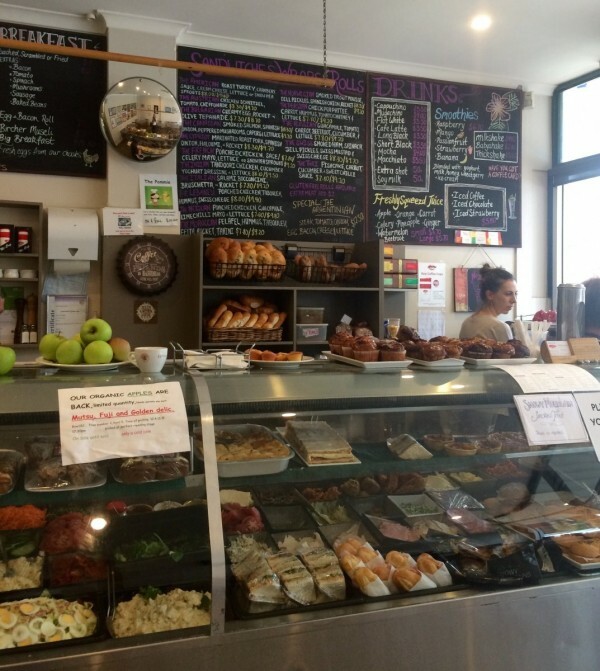 In addition to sandwiches, salads, breakfasts and coffee, Café D’lish also sells sweet treats, organic apples for a gold coin each and Snowy Mountains smoked trout. You could probably eat here every day for a month and still not have sampled everything. After about ten years staring at the sandwich options listed on the gigantic blackboard behind the counter, I finally settled on The French (poached chicken, sage and celery mayo and either lettuce or snow pea sprouts) on multigrain bread and a small side of roast vegetables, which came to a total of about $14.80. This was not an easy decision. The Canadian (smoked salmon, Spanish onion, peppered mushrooms, capers and lettuce, $8.30), The Austrian (chicken schnitzel, tomato and chiffonade, $8.30) and my old favourite The Moroccan (falafel, hummus, tabouleh, feta, rocket and tahini, $7.80) all looked like good options too. I suspect that Café D’lish can get quite busy in the early mornings as well as during the lunchtime rush, as there were several staff members working behind the counter – more than I would have expected to manage a reasonably steady flow of customers ordering coffee and breakfast. It meant, however, that my food was ready in just a few minutes. The woman who made my sandwich offered to wrap it in an extra layer of plastic to keep it fresh until lunchtime, which I appreciated. The roast vegetables almost didn’t make it to the office, as they were still warm from the oven and smelled delicious. I unwrapped my sandwich four hours later with trepidation, hoping it wasn’t soggy after spending a few hours in the fridge. 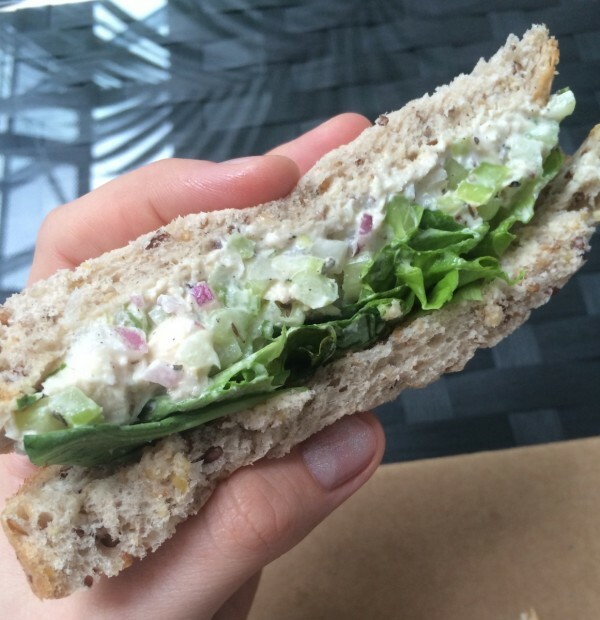 It was still fresh, and though it was essentially a jazzed up chicken and mayo sandwich with some herbs, celery and red onion, I thoroughly enjoyed it. 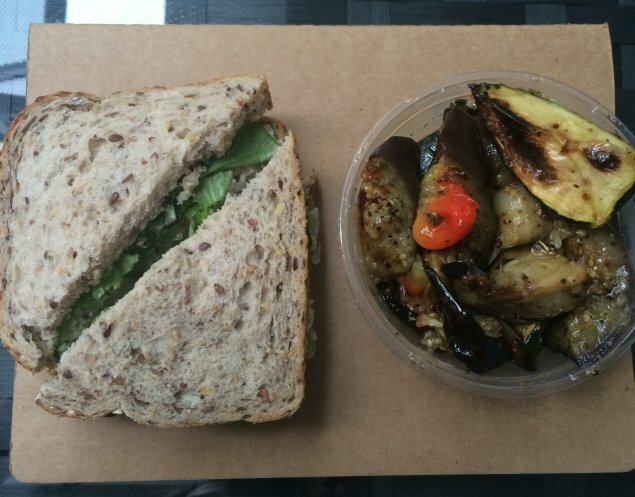 The roasted vegetables had a great flavour too, but were perhaps slightly too oily for my tastes. Sure, you can make a similar meal at home for less, but who can be bothered when there’s a place just a few minutes down the road that does it better? A warning: Café D’lish doesn’t have EFTPOS, so be prepared to bring cash or get money out at the ATM just around the corner. I work in Deakin and have bought food from Cafe D’lish quite a few times in the past few years. It’s always been very fresh and tasted good. One of our colleagues used to bring cakes from D’lish to work to share for morning tea – that person is sorely missed now that they have moved on to a new role. The vanilla slices are legendary! A really good vanilla slice has a light fluffy custard sandwiched between airy and flaky pastry dusted with castor sugar. The pastry should lightly crack, not bend nor be chewy. So sorry, I am still looking in Canberra. Anybody got any tips? But are they the “World’s Best Vanilla Slices”? I’d be interested to hear their story on why they told the CGGS girls they are no longer welcome. I haven’t been there since they did. I need to revise this, having looked into this a little closer, the girls were not specifically told they were no longer welcome, but due to the small space and the large backpack schoolbags carried by these girls they were made to feel they were always in the way and in the nature of the service they received as a result of that they felt unwelcome. Nice as D’lish is, I’d hardly call them Cheap Eats. Interesting that you had a problem with the oil in the roast vegetables but not the extremely unhealthy Mayo!